Specializing in hollow metal door and frame fabrication, complete commerical hardware bid packages for fire-rated & non-fire rated openings, our commercial department offers service that is second to none! With over 74 years of experience in builder's finish hardware, we are dedicated to providing our customers with top notch service & expertise! From drawer slides and European hinges to abrasives and adhesives, we offer a huge selection of products and all of the latest innovations tailored to the millwork industry! 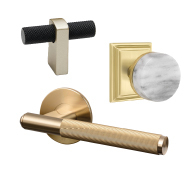 Our online store has 141,373 quality hardware products from over 248 different manufacturers.